When I read Ami im Schwabenland's blog post about her cooking class with pumpkin back in October, I thought that it sounded like something I'd really enjoy (especially because pumpkin is one of my favorite flavors!). I've only ever done a cooking class while traveling, but haven't yet participated in one "at home". To my delight, soon after that blog post Ami im Schwabenland invited both me and the blogger behind Kaffee und Kuchen to join her for their next class. After a few emails back and forth, we finally decided on last Saturday for our date. Getting to the cooking class was not as difficult as I'd expected. We just had to take the train out to Horb (am Neckar), which is only about 45 minutes southwest of Stuttgart. The challenging part was finding the best ticket. It took a bit of digging on the Deutsche Bahn website, but eventually Kaffee und Kuchen found a great deal: the four of us could take a slightly slower regional train on the Metropol ticket for just 35€ for the day. When we got to Horb, we then met Ami im Schwabenland at the train station, who was kind enough to drive out to the class. There were six of us total, including me, my husband, a close friend, Ami im Schwabenland and her husband, and Kaffee und Kuchen. The class was held at Straub's Krone (meaning "crown" in English), a restaurant that has been in the Straub family since 1937. I was struck by how bright and modern the interior of the restaurant was, though the building, the windows, and the art on the walls all gave a nod to the establishment's long reign. The current owner, chef, and our teacher for the day was Martin Straub. Martin immediately greeted us, and then led us through our menu for the day which was based around some Swabian classics: Käsespätzle mit Champignons (Swabian noodles with cheese and mushrooms), Maultaschen mit Kartoffelsalat (Swabian ravioli with potato salad), Eingemachtes Kalbfleisch mit Pfitzauf (veal ragout with Swabian Yorkshire pudding), and Apfelküchle mit Vanillesoße (apple fritters with vanilla sauce). Though he usually conducts the cooking classes in German, Martin (with the help of Ami im Schwabenland) had translated the recipes into English for us and was kind enough to conduct the class in English. Once he finished explaining the menu, we put on our aprons and away we went! Each person was given charge of a different part of the recipes, so that each of us played a role in cooking our meal for the day. We started with the Käsespätzle dough, the Maultaschen dough, and the potato salad. Swabian potato salad is not like the American potato salad that I'm used to; instead of a creamy base with mayonnaise, Swabian potato salad uses broth, oil, and vinegar. It's also usually served warm rather than cold. I decided to take charge of it, and began by boiling the potatoes. That's another difference: as an American, I would be inclined to peel and then cook the potatoes, but in Germany, the waxy "Festkoche" potatoes are boiled and then peeled while they're still hot. This is much easier as the skin pulls right off and, as Chef Martin explained, better because you get more of the flesh of the potato in addition to losing less of the starch to the water. After they were peeled, the potatoes were sliced and mixed with warmed beef broth, sautéed onions, mustard, vinegar, salt and pepper, and oil until the mixture "shone" or "smiled" as Chef Martin advised. I was in charge of this, too, and mixed the potatoes with my hands to avoid breaking the lovely rounds as a spoon would. Meanwhile, the others began making the Käsespätzle dough. This looked like a fun process, because when I looked over, Chef Martin was roughly beating the dough. He explained that it needed to be smooth and thick, almost like bread dough. He knew it was finished when he could pull up a giant spoon-full and see it hang down, but not drip. Next, the dough was flattened out on a wooden board with a beveled edge that was made for the task. Then, Chef Martin showed us how to move a flat plastic dough cutter quickly up and down at the edge of the dough to produce long, thin pieces that slid into a pot of boiling water to cook. The noodles were finished when they floated to the top of the water, at which point we fished them out with a slotted spoon and chilled them in cold water until we were ready for them. I didn't get to see much of the making of the Maultaschen dough or vanilla sauce, but I remember looking over every so often and seeing some measurements happening on the scale. That is one device that I have not gotten since moving to Germany, though I know a scale helps make cooking and baking more precise. I still prefer to use my recipes with cups and milliliters. When the Maultaschen dough was finished, it went into the fridge for about a half an hour while we made the meat and spinach filling, which was as easy as throwing the ingredients together in a blender. The real work began when the Maultaschen filling was ready and it was time to start assembling them. 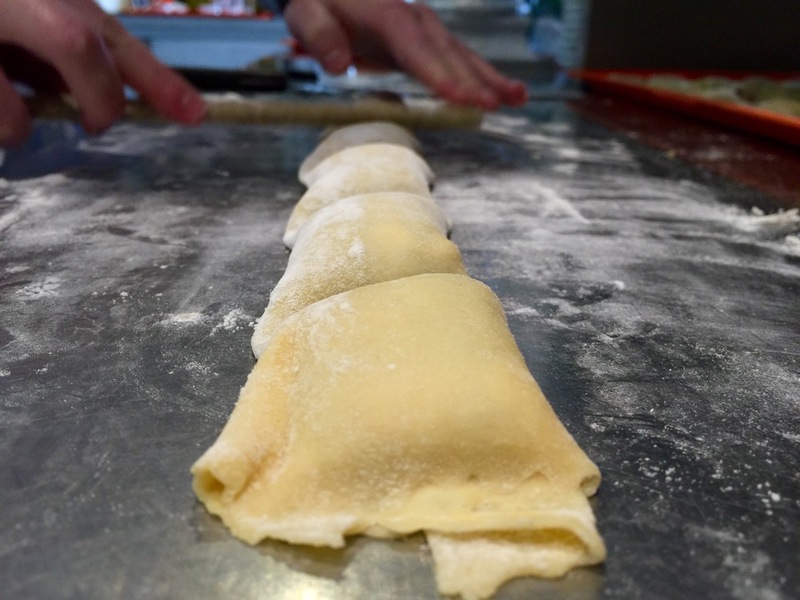 Chef Martin brought out a pasta roller and showed us how to roll the Maultaschen dough several times until it was "newspaper thin". Then we piped two long lines of filling out of a piping bag, rolled up the end to create a kind of rectangular log, and then carefully pressed and cut diamond-shaped sections of Maultaschen to await their final hot water bath. Once the cheese had melted, we plated up portions and sat down to enjoy the fruits of our labor with a lovely bottle of Müller-Thurgau from the Baden wine region. The great thing about Käsespätzle is that it's a very diverse dish. It made for a great appetizer for us, but can also be served as a side dish or even as its own main. The recipe we made called for mushrooms, but any vegetable will do, really, and you can even add bits of bacon or ham. Before we could dig in for seconds, we got up to start on the Yorkshire pudding and veal ragout. The Yorkshire pudding batter just needed to be thrown together and poured into some buttered cups. Meanwhile, we heated the water for the veal and added in what the Germans call Suppengrün, a pre-packed mixture of the greens commonly used as a soup base, including a leak, celery, carrot, and parsley. This makes a lot of sense as the package comes with just one of each vegetable -- exactly what you'd need for a pot of soup -- rather than forcing you to buy bundles of each that might eventually never be used. After the broth boiled, Chef Martin removed the pot from the heat, added the cubed veal, and let the meat sit and slowly cook in the broth. While this was happening, we boiled the Maultaschen and finished up the potato salad. One mistake I made was not adding enough mustard, vinegar, and broth to the potato salad, because although it tasted fine when I'd finished it, the salad absorbed some of the dressing as it sat. This was confirmed by Martin's Swabian aunt who tasted the potato salad as we were plating it up. It still tasted yummy, though, when we paired the potatoes with our homemade Maultaschen topped with caramelized onions (declared to be the smell of Swabia by Chef Martin). We all remarked on the quality of the meat filling and the lightness of the dough in the Maultaschen; we could clearly taste the difference in the homemade version. Still, as Chef Martin told us, some store-bought brands will do, but what you really can't get in a store is the potato salad. Nothing that's cold and picked up in a store can substitute for homemade potato salad, and just about every German family will have their own special way of making it. The veal ragout and Yorkshire pudding were quick to prepare after all that work. We just had to finish the white sauce (more onions, butter, an egg yolk, and cream with a splash of wine and lemon juice), and add in the veal. The mixture was then poured onto a plate and served with a Yorkshire pudding on the side. The decadent sauce paired well with the pudding, and I was surprised by how tender the veal turned out. For having been effectively slow-cooked in broth, the meat was still juicy and tender, and had a perfect pink color inside. By this point, we were mindful of the clock, both to catch our train and finish up in time for Chef Martin to prepare for the dinner shift. Dessert took no time at all. We peeled and sliced up the apples, whipped up a quick beer batter, and dunked and dropped the finished slices in a deep fryer. Of all the gadgets that we used during the class, the deep fryer is the one that I tried to justify buying the most. The deep well of oil fried up the apple slices so beautifully that I still want to sacrifice some of our tiny kitchen space to get one. Once they were finished, we tossed the slices in some cinnamon and sugar and plated them up with the vanilla sauce that we'd made earlier. Dessert was both simple and delicious, and I was struck by a deep sense of nostalgia as I remembered the taste of cinnamon-apple doughnuts at Carter's Mountain Orchard during the harvest season in Virginia. As we made our way back to Stuttgart on the train, we reflected on all that we'd learned that day and on how great a teacher Chef Martin had been. He was so calm throughout the lesson, even when we made mistakes, like when we added too much milk all at once to the Yorkshire pudding and they didn't rise as much as they should have, or when we cut the apples in slices instead of in rings as the directions said. He'd just pause for a moment and then conclude with, "Well, let's see what happens." He was so laid back in the kitchen, telling us stories and jokes, that he really made us feel comfortable. It was especially clear how knowledgeable he was as a chef as he seasoned and mixed ingredients based on feel, look, or taste rather than strictly following a recipe. He also taught us some fabulous techniques for little things like chopping up onions and holding a piping bag, which I'm sure we'll be able to use for many meals to come. Straub's Krone offers several cooking classes each month, which you can find on their website. Chef Martin described the Asian course to us, which sounds delicious, and I'm also intrigued by the "Spring" course in April when it's Spargel (asparagus) season in Baden-Württemberg. Courses range from 68€ to 78€ depending on the menu, and last for about 6 hours. And of course, you can let Chef Martin do the cooking and try something from his menu that changes seasonally. The restaurant is open for lunch or dinner Tuesday through Saturday or for Sunday brunch; they are closed on Mondays. Have you attended any cooking classes in the Stuttgart area? I'd love to hear your recommendations in the comments section!